A small very dark coloured gecko can often be found on our black-painted front gates where he is much better camouflaged than he appears to be in the photograph. Waiting until the very last moment to move as you approach the gate it suddenly dashes off rapidly: it makes me jump every time, even though I half-expect it to be there. 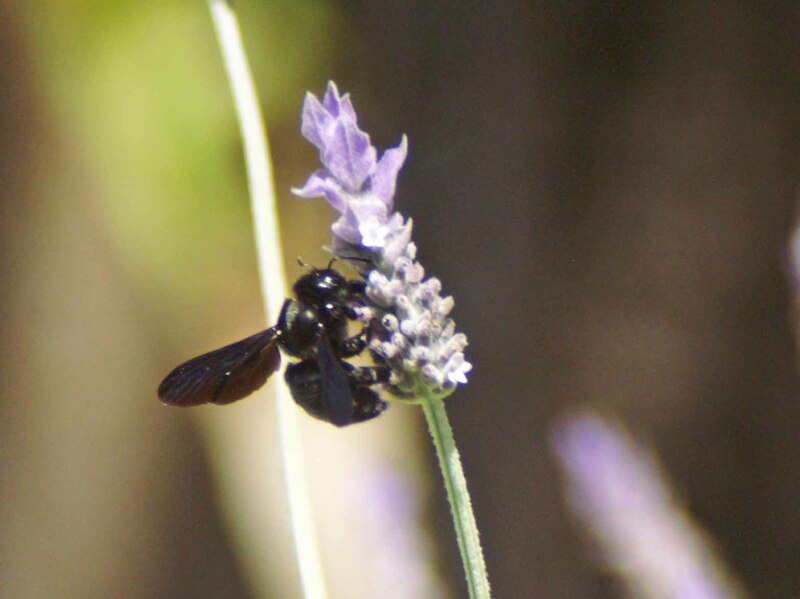 Despite their size and bulk Violet Carpenter Bees manage to land on the small flower heads of the cut-leaved lavender, the stem bending under its weight. 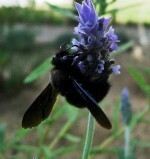 Their attentions do not benefit the flower, they can take nectar without picking up any pollen. The last three wet winters we have had here have done wonders for increasing the variety of wildflower species that have colonised the ‘waste’, or vacant plots of land in our locality. At the moment they are at their best and attracting a fair amount of insects, which is good news for the birds still feeding unfledged or recently-fledged young and even better for the Spotted Flycatchers that are only just beginning their breeding cycle. 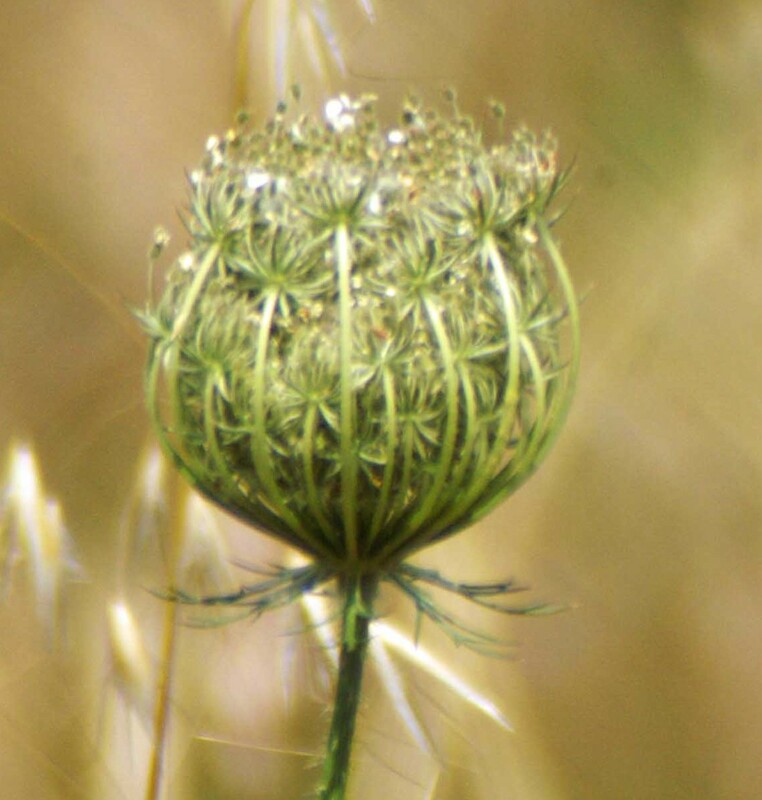 Wild carrot began flowering a while ago and although continuing to flower, earlier blooms have begun to go to seed now, I love the way it bunches its florets up into a tight, lacy goblet shape. 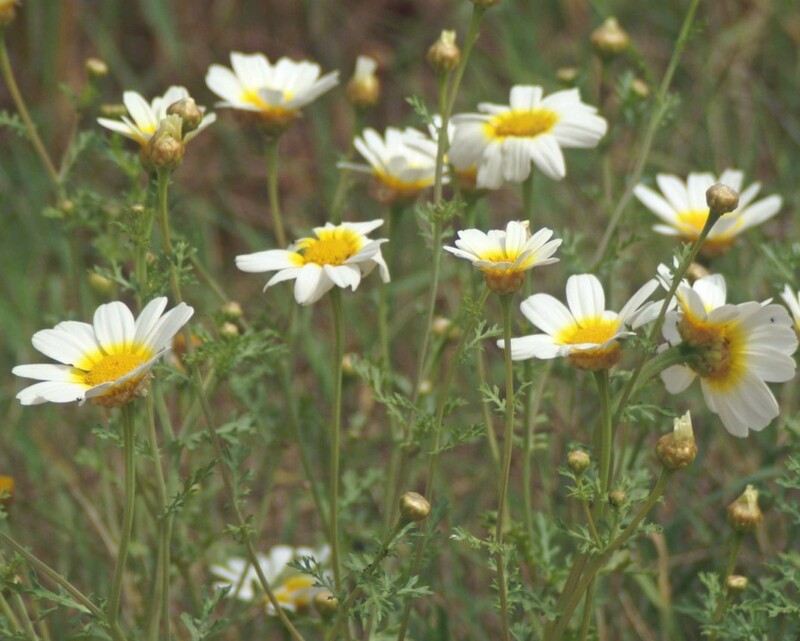 Crown Daisies most frequently have golden yellow flowers, but there is a variety that produces white flowers with a yellow centre. 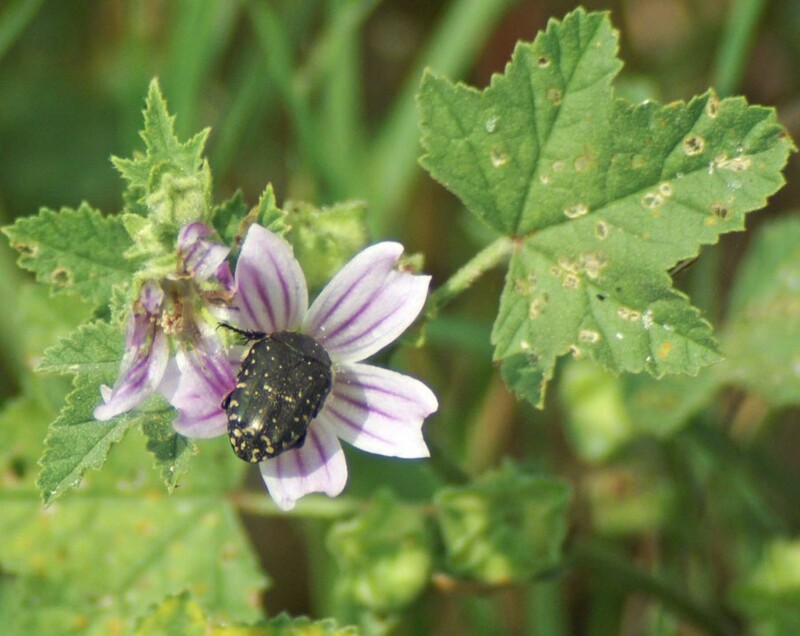 One of the prettiest of the wildflowers growing locally is a mallow (malva). 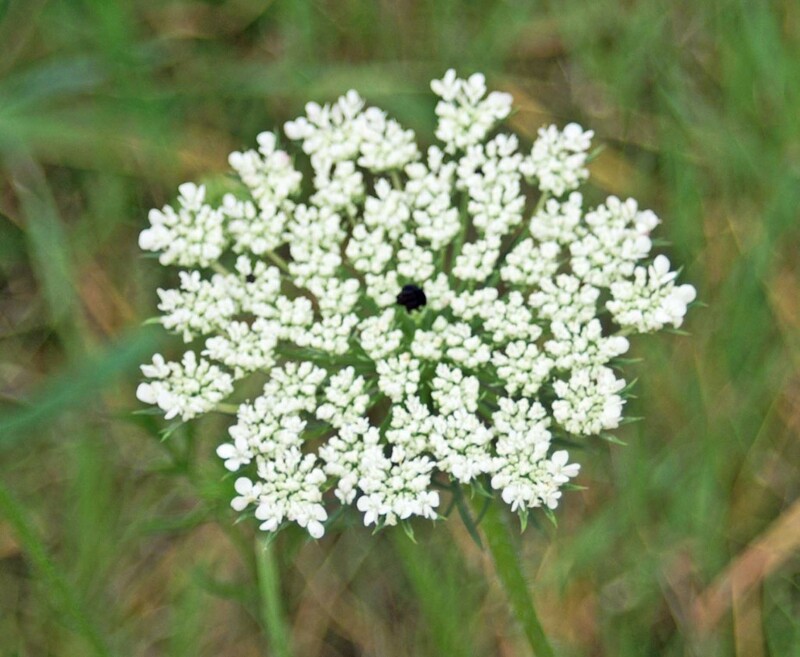 This is the plant that can often be seen in large patches along the roadsides. 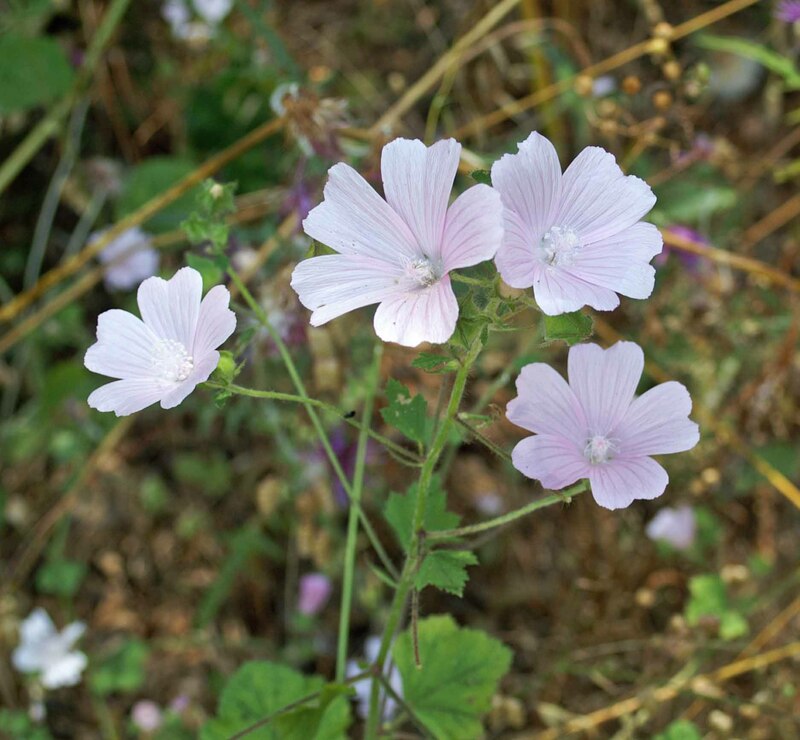 There are quite a few malva, or mallow species found here, and they can be difficult to name, some also hybridise. 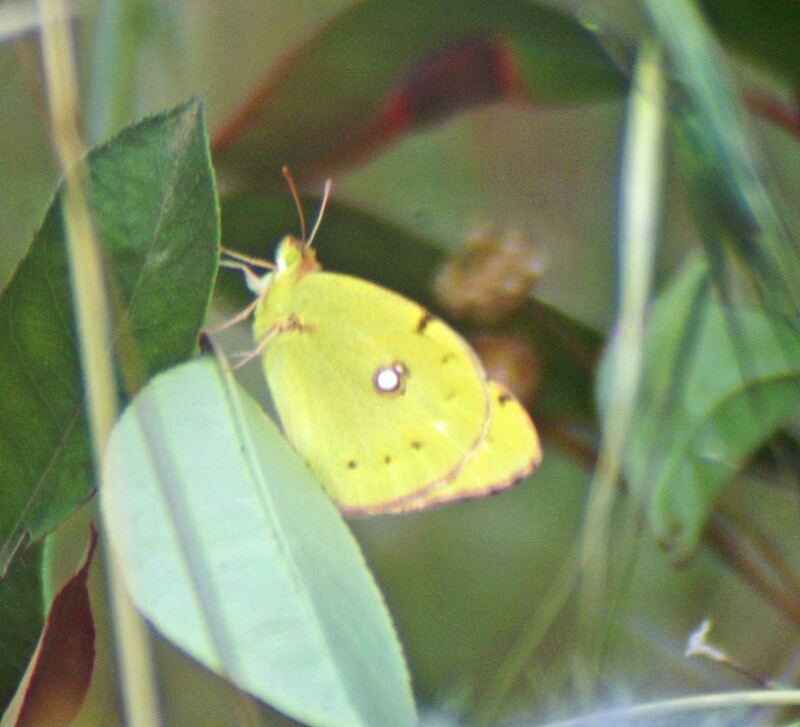 Two Clouded Yellow butterflies passed overhead, a blur of golden yellow engrossed in fierce aerial combat. Suddenly breaking apart they went their separate ways, one flew up and away while the other retreated to recover on a leaf amongst the long grass. 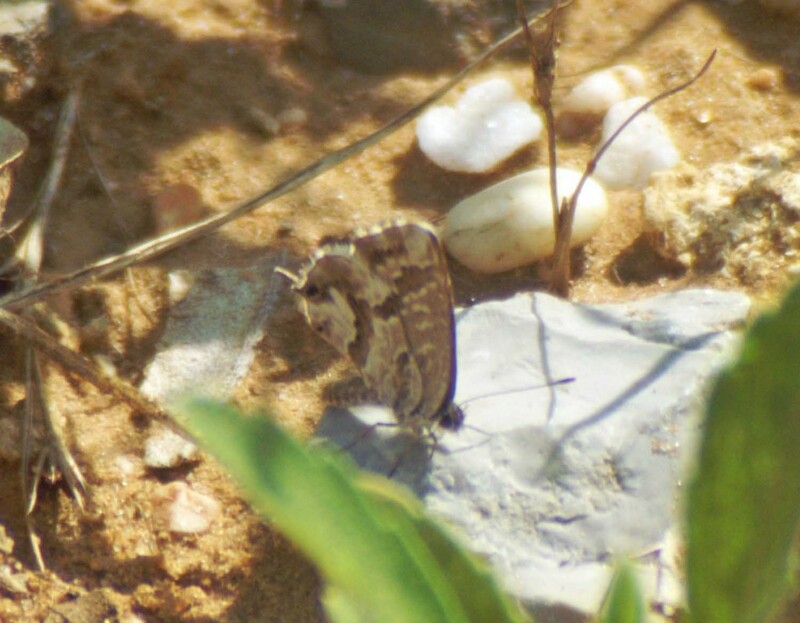 A butterfly I was not quite so pleased to see was a tiny Geranium Bronze. A true native of South Africa, it’s thought their first introduction to Iberia was through Majorca,via imports of their LHPs, which as the name suggests is geraniums. They have spread quickly, colonising many parts of Southern Spain where the popularity of brightly coloured pelargoniums and suitable climate provides them with ample opportunity to thrive. This is the first individual of the species I have seen so far this year, so I’ll be guarding my geraniums now, they’ve been looking so good this year too. 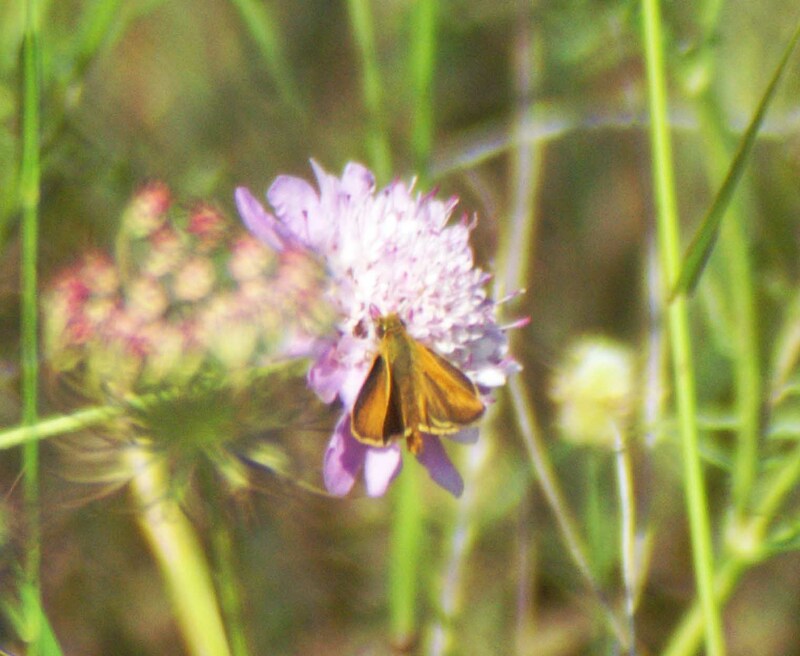 I had set out on this little wildflower expedition to try to find a particular little butterfly and just as I had decided to turn round and head home I spotted it – just one Small Skipper on a scabious flower, a plant which is beloved by a good many species of butterfly and an important LHP to several species too. of me again, this time from the other side of the vegetation into the neighbouring empty plot, heading for the cork oaks next door to our house. Spotting movement low down on a branch where the bird had flown out from I looked to see that a young one had followed it and was wobbling trying to balance itself. 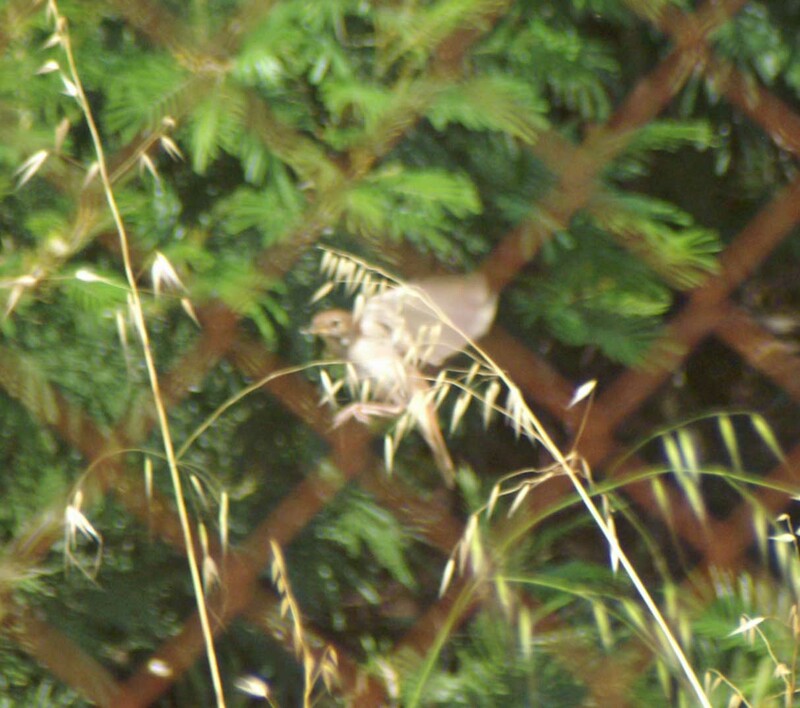 It flew out, attempted to land on a grass stem, then flew back into cover, piping plaintively. I carried on home and stayed there for a few minutes to let things settle down, then set off again hoping to get more views of the Nightingales. Waiting by the gate where I had the earlier sighting I was lucky enough to see an adult that flew from very close by across the road to a cork oak, then another bird came in to the tree in front of me. 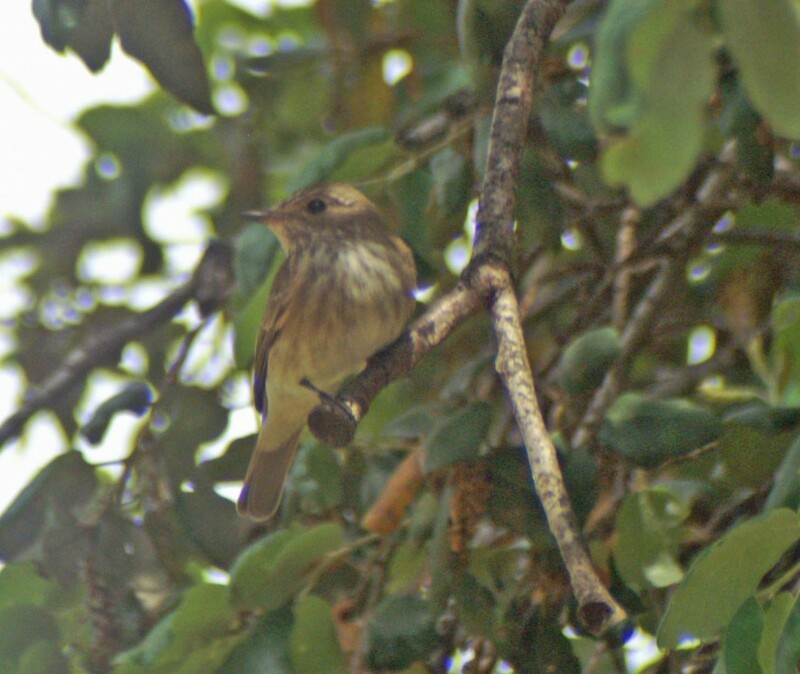 Not a Nightingale, but a perfect view of a Spotted Flycatcher. Back at home once more I could hear the almost constant and very loud piping of a young nightingale and had a couple of views of it as it perched briefly on top of the wall then perched in a small tree. There were other recently fledged birds around too. Yesterday I heard young-bird- summoning calls emanating from the cork oaks and traced them to two Short-toed Treecreepers. It was late afternoon and too shady to try to photograph them, but hearing similar sounds this afternoon I went to investigate. 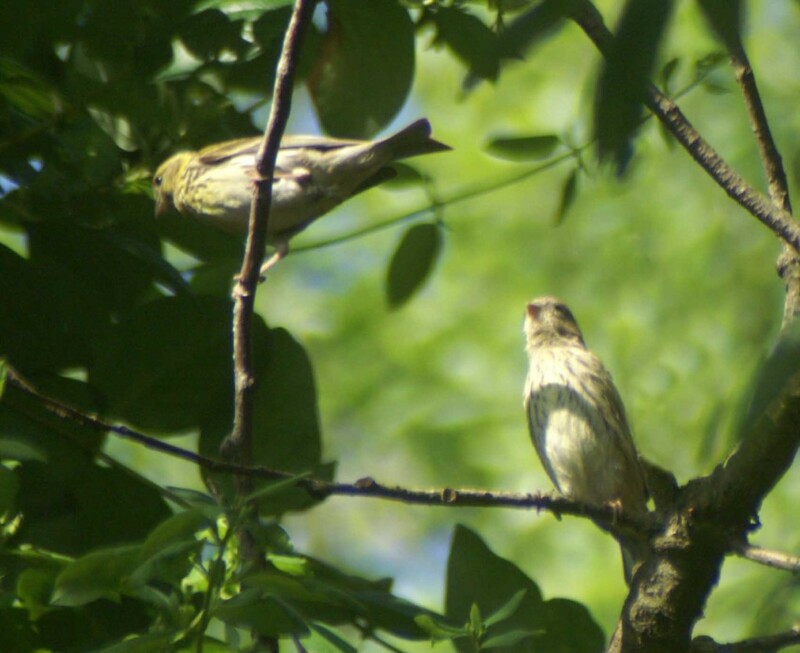 I located the source of the sounds, quite high above me in a tree, but they were not those of Treecreepers, these were two lovely young Serins. It is wonderful to be witness to the next generation of these beautiful young birds of very different species venturing out into the world, and I’m sure if I pay due attention the next few days will bring forth even more. One thing I have noticed they all have in common is the small size of their families. The Chaffinches that fledged a couple of weeks ago had just two chicks, the Nightingales may have two, but I suspect just the one this year,there were two young Short-toed Treecreepers and just the two Serins. I can only speculate that family sizes are tailored to the amount of locally- available food; it makes sense to be able to feed two offspring well than more insufficiently. 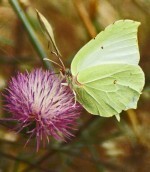 This entry was posted in Birds of Southern Spain, Butterflies of Southern Spain, Dragonflies of Southern Spain, Migrant birds, Nature, Nature Photography, Wildflowers of Southern Spain, Wildlife of Cadíz and tagged clouded yellow, common mallow, crown daisy, dwarf mallow, fledgling birds, geranium bronze, Moorish Gecko, Nightingale, Red-veined Darter, scabious, Serin, small skipper, spotted flycatcher, Violet Carpenter Bee, wild carrot. Bookmark the permalink. just come back from Benalmadena’ beautiful flowering trees in Paloma park’ any idea what they are please? Flowering early march, flowers like clianthus flowers but in clusters. There in early March. Hi Marion, you have probably looked at pictures of clianthus and decided that was not your plant, did you take any photographs or can you give me a bit more detail, colour, size, how the blossom grows, i.e do the clusters hang down or are they more upright? You have me intrigued now!